Have you ever stood on a sideline loving the way your granddaughter hustles, pivots, and bicycle-kicks a soccer ball? Do you also feel a little touch of envy? After all, just a few decades ago, women had little opportunity to play hard together. That all changed with Title IX, which made sports more available to women and girls. Women are discovering skills they never knew they had while boosting their brain power, strengthening their hearts, and hardening their bones. Although Title IX is most often associated with women’s athletics, the 1972 legislation didn’t mention sports. The legislation simply states that if your federal tax dollars are paying for something, the money must be spent on both boys and on girls. Despite the specific omission, the immediate and visible impact on sports participation has been tremendous. In 1972, there were only 700 high school girls playing soccer. 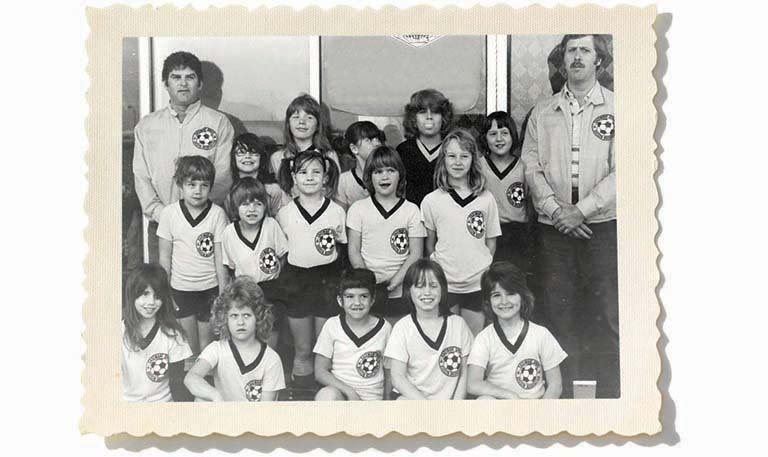 By the 1975-76 school year, the number of girls playing soccer leapt to 11,534. Forty years later 371,532 high school girls were playing soccer. And that’s just soccer. Add in everything else, and well over 3 million girls will turn out for a team this school year. If you’re a fan of women’s soccer, you may have found it easy to daydream about your granddaughter becoming the next Mia Hamm or Abby Wambach, Hope Solo or Carli Lloyd. But what you really want for your granddaughter is good health—and letting girls play sports nets lifelong improvements in brain, bone, and heart health. Take a quick glance back through the family photos. Do you see your daughter in impossibly tall tube socks and skimpy running shorts? Perhaps there is an embarrassing photo of her (or you!) in a Jane Fonda-esque aerobics outfit. While girls have been signing up for team sports, their mothers have been making their way to Zumba, Crossfit, hot yoga, and boot camps in ever-growing numbers. Keeping a trim figure with cottage cheese and pineapple has been replaced with spin class and barre. It is not just the muscle that tones. An athletic lifestyle sets women up to significantly reduce the chance of dementia, skirt the devastation of osteoporosis, and skip the heart attack. Researchers say people who are fit at age 50 are 36 percent less likely to be diagnosed with dementia in their 70s and 80s. The benefits continue as the decades pass: Being fit at 70 reduces your risk of developing dementia by 32 percent. Weakened bones cause 2 million fractures every year. When we exercise, we not only improve our muscle tone, but put a demand on our bones that may even cause them to become stronger. Regular exercise will strengthen your heart and help you sleep better. It is never too late to reap the benefits of exercise. Title IX has indirectly led to a seismic increase in the number of fitness programs available for older adults. Of course, for women who grew up in the pre-Title IX era this might take a little planning. Chronic pain, arthritis, joint replacements, diabetes, or even blood pressure concerns may make heading straight out to the gym unfathomable. Fortunately, a few personal trainers specialize in older adult fitness and some hold advanced certifications in medical exercise. Talk to your primary care provider about enlisting an expert to help you prioritize and navigate a fitness plan. Then check out what the local parks department or senior center has to offer. Whatever you do, don’t let your granddaughter have all the fun. It’s your turn to keep your body healthy and protect your mind. Lisa Stuebing is a recognized leader in older adult fitness. As a medical exercise specialist, her emphasis is in brain health, chronic pain management, and movement disorders. In addition to seeing private clients in their homes, she teaches for the Brain Injury Alliance of Washington and gives talks on behalf of both the Arthritis Foundation and the American Heart Association | American Stroke Association. Contact her at CoachLisa@ MudPuddleFitness.com. When I was in 5th grade my classmate sued the people who ran the Little League because she wanted to play. At the time, it seemed to both fit and not fit with my world view. Women were deciding who they wanted to be and what they wanted to do in the world. The debates about what was appropriate rang out across the playground and spilled over my own home dinner table. As I researched this article, I began to understand how this one courageous kid really did shape my personal world view as I ventured into adulthood. Just yesterday, Nicole Brodeur who is a Seattle Times columnist gave us an update on the state of women’s pay for professional sports. Check out this article: “For female athletes, equal pay is not a game”.